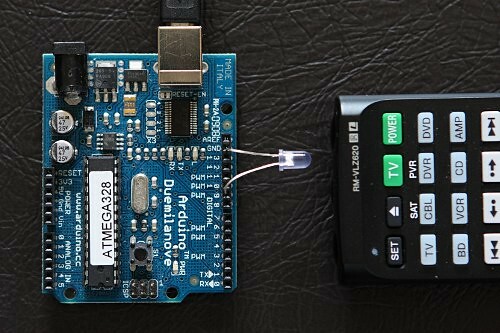 This project uses the Arduino hardware for playing back infrared remote control code. The format played is the Pronto Hex format. There is a huge database of infrared code located at RemoteCentral. I did this project for teaching my learning remote the discrete on/off power code of my TV. The code sent by the original TV remote is the power toggle command. This is not so good when used as part of a macro for controlling multiple devices. This entry was posted in Uncategorized on January 15, 2011 by stephen. Sparkfun free day is part of Sparkfun’s marketing stunt that started last year where they gave away $100,000 with a limit of $100 per person. This year they increased the amount to $150,000. I’m not sure $30 is worth the trouble of staying up from 3am to 5am pressing the refresh button on my browser. Anyway I’m happy getting the voucher. This entry was posted in Uncategorized on January 14, 2011 by stephen. 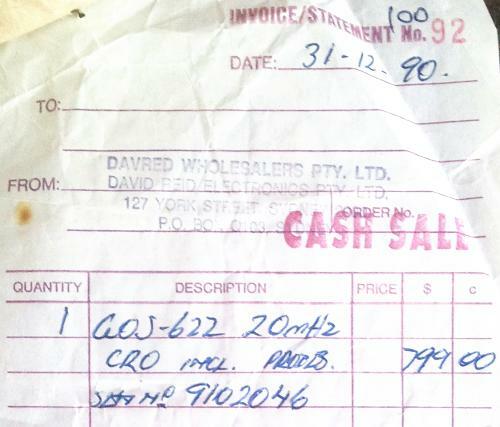 During clean up I found the receipt for my first oscilloscope. It was for a dual channel 20 MHz CRO. I bought it 20 years ago. I would’ve been extremely happy getting it. I was only in year 11 back then. I don’t know how I convinced my dad to pay $799 for it, must have been a lot of money back then. I bought the oscilloscope from David Reid Electronics, one of the three electronics shop that was on York St, Sydney. I like that shop, it’s sad to see that shop closed down. This entry was posted in Uncategorized on January 13, 2011 by stephen.